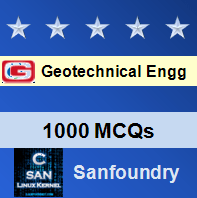 This set of Geotechnical Engineering Multiple Choice Questions & Answers (MCQs) focuses on “Unified Soil Classification”. Explanation: In 1940, casagrande originally developed the unified soil classification system (USCS). 2. The USCS system was used for which of the following purpose during World War 2? Explanation: In the earlier stages of World War 2, the USCS system was used for air field construction. Explanation: According to USCS the fine grained soils, whose behavior is controlled by plasticity, are classified on the basis of their plasticity. 4. By USCS system, soil are classified in to ___________ Major groups. 5. A soil is considered as coarse grained, if it retains more than ___________ in a sieve. Explanation: If more than 50 % of the soil is retained on a NO.200 US sieve (0.075), it is designated as coarse grained soil. 6. Coarse grained soils, containing fines between 5-12%, are designated by ___________ Symbol. Explanation: If the percentage of fines lies between 5 to 12 %, coarse grained soils are designated by dual symbols GW-GM or SP-SM. Explanation: Based on their liquid limit and plasticity index, fine grained soils are subdivided in to silt and clay. Explanation: Based on the liquid limit and plasticity index, fine grained soil is subdivided. Explanation: Based on the soil size, coarse grained soil is divided in to gravel and sand. Explanation: In Casagrande’s plasticity chart, the numbers denote relative suitability with No.1 as the best and No.10 as the worst.